We got quite a bit of the white stuff around here this weekend with a little over two feet in Central Park. It started snowing much earlier than expected (or at least much earlier than I expected), so I ended up having to struggle home from dinner Friday night in a pair of high heels. Not my best move. I’ve now swapped them out for boots, so I’m all good. My home town of Maryland was also hit pretty hard, from what I can tell, my friends are are still digging out, schools are cancelled, and government offices are closed. In the days leading up to the storm, I’d been working from home, laid up with a case of the sniffles and a sore throat and a general achy-ness, and I made a soup that helped me muddle along and, since it’s one of those clean-out-your-pantry dishes, I figured it would be good for those of you still stuck inside with limited access to fresh anything until the stores restock. I intended to post it before the storm, but, well, sometimes life gets in the way, so you can think of this as preparation for the next snowfall. This red lentil soup is admittedly not dissimilar from one that I made on this blog almost 5 years ago. I even photographed it in the same bowl! You let the lentils melt in piles of onions and tomatoes and spike the whole lot with cumin, coriander, and a healthy pinch of cayenne. I amped up the tomato flavor using estratto di pomodoro – an intense tomato paste made by concentrating tomato pulp in the sun – that I toted home from Sicily. You can obviously use regular tomato paste if you didn’t have the luxury of having one of the best vacations of your life over the summer. This soup is a savior if you’re sick or holed up or just want dinner. Adapted from the New York Times. I didn’t have whole cumin and coriander seeds, so I used about half the measure of ground. Cook. Heat the oil in a large, heavy pot and add the onion. Cook, stirring, until tender, about 5 minutes, and add the garlic, 1/2 teaspoon salt, cumin, coriander, curry powder, and cayenne. Stir together for about a minute, until the garlic is frangrant. Lower the heat if the garlic starts to brown too much. Stir in the tomato paste and cook for another 5 minutes. Stir in the tomatoes with their juice. Simmer. Bring to a simmer and cook, stirring often, for 10 minutes, until the tomatoes have cooked down slightly. Add salt to taste (I added another 1/4 teaspoon). Simmer more. Stir in the lentils and stock or water. Bring to a boil, reduce the heat, covers and simmer 30 minutes. Add salt to taste (I didn’t feel like it needed any more at this point) and continue to simmer for 15 to 30 minutes, until the lentils have fallen apart and thickened soup. Puree. Use an immersion blender to puree the soup. Add the pepper, taste, and add cayenne if you want more spice. Taste and adjust salt. Stir in the lemon juice. Serve. Top each bowl with a swirl of yogurt and a generous sprinkling of parsley or cilantro. Squeeze a lemon wedge over top. Hello, 2016. It’s going to be a good year, I’m convinced of it. I was in DC for New Years with my friends Nachama and Ilana. It was a chill weekend – we saw Kiss Me Kate at the Shakespeare Theater (free tickets! ): nothing like a little musical (blatant misogyny aside) to get the year started right. We went to synagogue (!! ), something I’d like to do a teeny bit more of going forward, and walked a lot and ate a lot and caught up a lot. Based on this photo, you might think I’m starting the year off with a cliche: a healthy looking grain bowl as an antidote for holiday gluttony. But I’m posting it on behalf of Nachama who asked for help with easy lunch ideas for her microwave-free office. Even though I sent her a few articles on mix-and-match grain bowls (here, here, and here), she asked for more specific instruction. So, here’s one of the first lunches of 2016. If you’re going to buy pre-washed greens (arugula, baby kale, etc. ), find some that are in plastic clamshell boxes rather than bags – in my experience, they tend to last longer. I make a batch of grains to last a few days, and they’re even better if you drizzle them with a little olive oil and lemon juice for . Sometimes I even cut up two days worth of veggies to make salad assembly easy. One thing I left off this bowl was crunch – mostly because I forgot, but on other days, I’ve toasted a bunch of pumpkin seeds to throw on top. Adapted from the New York Times’ recipe for salmon roasted in butter. This is a versatile recipe – Mark Bittman suggests making it with butter and dill or parsley, olive oil and thyme, or peanut oil and cilantro or mint. I didn’t have any fresh herbs, so chose to use some mustard seeds to go with a mustard vinaigrette. I adapted the recipe for a single small fillet of wild salmon, but I’ve also made this recipe in a larger skillet for several pieces or one large piece – you may just need an extra minute on each side. Heat oven to 450ºF. Place 2 teaspoons olive oil and 1/4 teaspoon mustard seeds in a roasting pan or skillet just large enough to fit your salmon and place it in the oven. Heat about 5 minutes, until seeds start to pop. 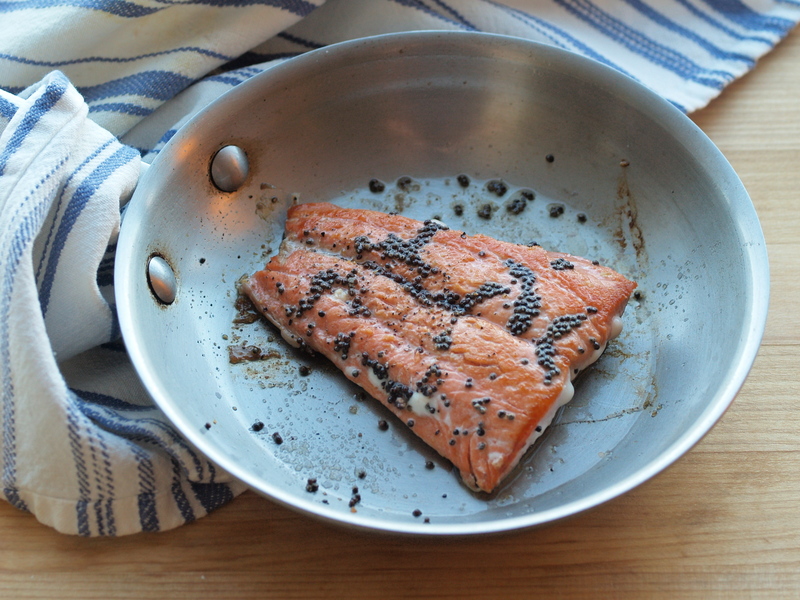 Add a 5- or 6-ounce piece of salmon to the pan, skin side up. Roast 3 minutes. Remove from the oven, then peel the skin off. (If the skin does not lift right off, cook 1 minute longer.) Sprinkle with salt and pepper and turn the fillet over. Sprinkle with salt and pepper again. Roast 2 to 3 minutes more, depending on the thickness of the fillet and the degree of doneness you prefer. There are infinite variations on grain bowls and I typically grab whatever I have in the fridge and pantry. 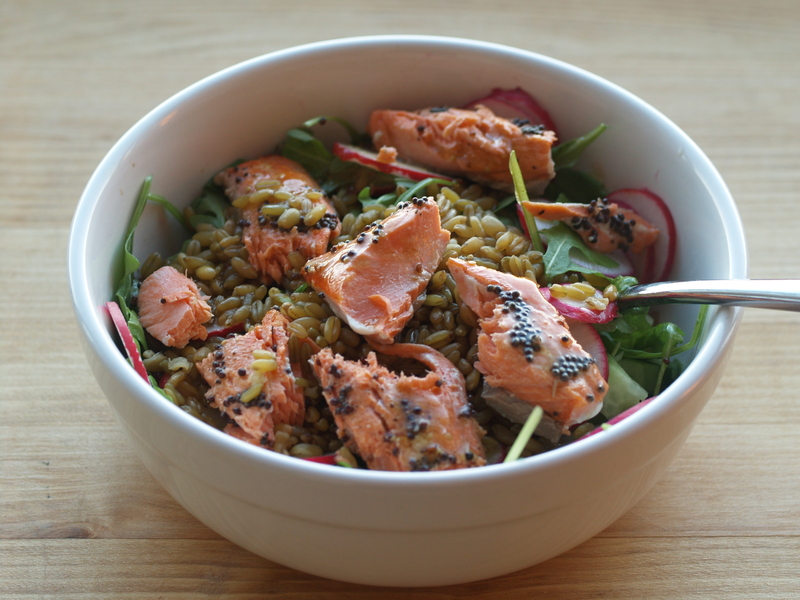 For the first grain bowl of 2016, I topped 2 handfuls of arugula with 1 Persian cucumber (cubed), 3 radishes (thinly sliced), 1/3 cup freekeh (cooked in a pressure cooker), and a fillet of salmon. Then I drizzled the whole thing with a few tablespoons of mustard vinaigrette (1/2 t whole grain dijon mustard, 2 T red wine vinegar, 1/4 C olive oil, salt, and pepper). I work from home these days, but you can keep a jar of the vinaigrette in the fridge at work – it should be enough for about three salads.